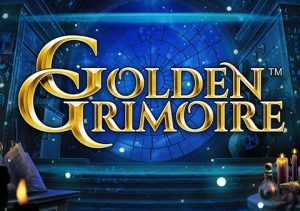 Open up a magical portal and take yourself to a fantastical world in Golden Grimoire, a sorcery-themed video slot from NetEnt. Played using a 5 reel, 20 payline game engine, it comes with mystery transforming symbols and a bonus round that awards 8 free spins complete with sticky mystery symbols. Play on all devices from between 20p and £400 per spin. A wizard’s laboratory is the setting for this good-looking game. Flanked by dripping candles, bottles of potion, books of spells and drawers of who knows what, the reels include lower value playing card suit symbols plus 4 higher value gemstone-style animal symbols. The best of this quartet is the spider on the red stone which pays 5 times your bet if you land 5 on the same payline. Appearing on reels 3, 4 or 5 only is the Grimoire or book of spells which is the Mystery Symbol. This can transform into any high or low value symbol or better still a wild. If this transformed symbol matches the symbol on the same row on the first reel, all the symbols in between will also transform into a match. If a Mystery Symbol turns into a wild, all the symbols between the Mystery Symbol and reel 1 will turn wild. This is called the Mystery Symbol feature. Land the scatter symbol on reels 1, 3 and 5 on the same spin and you’ll trigger the game’s Free Spins feature. On offer here are 8 free spins complete with the Sticky Mystery Symbol feature. These Sticky Mystery symbols act just the same in the base game. They stick in position for the rest of the feature rather than being in play for just the 1 free spin though. You can land Mystery symbols on reel 2 during the free spins as well as on reels 3, 4 and 5. As usual for a NetEnt video slot, the design in Golden Grimoire is very nicely done. There’s an alchemical feel to the visuals and the soundtrack has that magical feel. At first glance, the gameplay looks a little ordinary but the Mystery symbols can deliver some excellent action, especially in the Free Spins feature. Land multiple Mystery symbols early on during the feature and the coins can quickly build. Saying that, you can only win 200 times your bet on each spin/free spin so this low variance game isn’t really appealing. The sorcery theme is a popular one in the online casino world and Golden Grimoire is an impressive addition to that already bulging selection, design wise. If it’s sorcery you’re after, ELK Studios’ The Wiz is highly recommended and also high variance.